Feed The Cat is skatepunk band from Toulouse, France. Never Press Rewind, Except… is their second release after the EP Kick The Fat. Their sound is undeniably skatepunk. For some reason I'm reminded of Smartbomb. 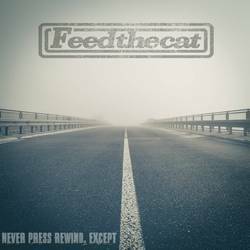 Not the most well known of all skatepunk bands, but Feed The Cat has the same vibe. Musically it's slightly different though. Skatepunk in my mind is about short, raging songs. Songs that hardly pass the two minute mark. Feed The Cat have a completely different vision on song lengths. The shortest song is three minutes, but most songs are close to four minutes or even surpassing it. And there is something wrong with that. The first track "Memories", burst from the speakers. After a short, melodic intro things get going. And it keeps on going and going and going. Tiring the listener unnecessarily. "Memories" is also the worst offender, lasting almost five minutes, while it should have lasted a maximum of three minutes. A little self-editing would have improved this song a lot. And not only this song, but all seven songs on this EP. Speaking of self-editing: "October 12th" is something that the band could have skipped for all I care. This calm, instrumental track is probably meant to give you some time to breath. The only thing this track achieves is that my two cats are staring at my boxes to see where that cat is hiding that they can clearly hear (at least, that's what I think they are doing). I am not sure whether it's because of the lack of editing, but these songs don't stick. The only reason I know the EP is over is that I hear the church bells at the end of track 7. Nothing really stands out. And that is a shame. Because I assume the band does know how to write an energetic riff, they all master their instruments and, not unimportant: the production is top notch. I do hear a lot promise in Feed The Cat. Unfortunately it doesn't translate to a great EP on Never Press Rewind, Except… I do look forward to new material as I am curious to how this band will develop. Posted June 11, 2018, 5:57 p.m.